The ASUS ROG SWIFT PG248Q is a gamer’s monitor, that’s for sure. For a 24″ screen and an HD resolution you’ll have to be an enthusiast to pay the asking price. But the hook to draw you in is the inclusion of Nvidia’s G-Sync technology and a maximum overclocked refresh rate of 180hz (in standard mode you get 144hz). This is a premium display that offers just about the best gaming experience available at 1080p. The sturdy stand has a full compliment of adjustments, you’d hope so from a premium priced monitor. This includes a generous 120mm of height adjustment and a 20 degree backward tilt. The overall look has a “gamer” feel without being too dramatic, it does include an LED ring round the base. I’m not sure it’s exactly to my taste but we all have our own preferences here. It seems a bit on the chunky side with it’s thick borders. Connectivity isn’t amazing, just one HDMI and DisplayPort are included. You do get a USB hub and headphone out. If that’s all you need then it’s not a problem, don’t let it put you off. But if you want to connect a console and DVD player then you’re out of luck. The monitor also includes the GamePlus mode which allows you to add crosshairs, start a timer, and show your FPS. I’m not sure if that’s considered cheating or not but the option is there should you wish to exploit it! 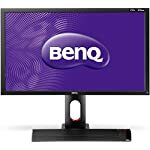 So, is the PG248Q good for gaming? Well, yes. But you’d hope so given the feature list and price! It also has excellent colour accuracy once you’ve taken care of calibration. So what makes the ASUS a good gamer monitor? First up it includes Nvidia’s G-Sync technology. 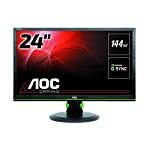 This ensures that the rate at which the monitor displays frames is kept in sync with the rate at which your graphics card can produce them. This comes into its own during those moments when your GPU struggles to keep up and the frame rate dips. On a less well equipped monitor this event can result in tearing, where the image appears broken as the monitor struggles to display frames. You also get a very fast refresh rate. By default it can run at 144hz but this can be overclocked to a massive 180hz, that means if your graphics card is fast enough you can display 180 frames on your screen every second. 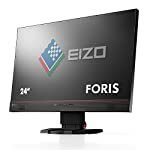 Some might argue that the benefits of a fast frame rate drop off and you won’t perceive a big jump from 144hz to 180hz but if you want the smoothest image available then this is the place to look. Being a TN panel you get a 1ms response time ensuring that this monitor is going to keep up and provide lag free gaming. You’ll need a decent PC to push the monitor though. There is little point in all this if your old GPU can only muster 40 frames per second! We give the ASUS ROG Swift PG248Q a 4 out of 5 rating. Want to know what existing owners of the monitor think? You can read real user reviews here. 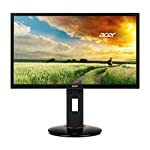 Should I buy the ASUS ROG Swift PG248Q? The PG248Q offers great performance but only you can decide if it is worth the premium price. 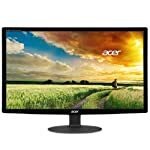 There are cheaper options out there that provide adaptive sync technologies and fast refresh rates. Still, if you are looking for a a pro gaming 1080p display with no expense spared... If you are having some doubts about this purchase then why not read some real owner reviews and see what other buyers think.